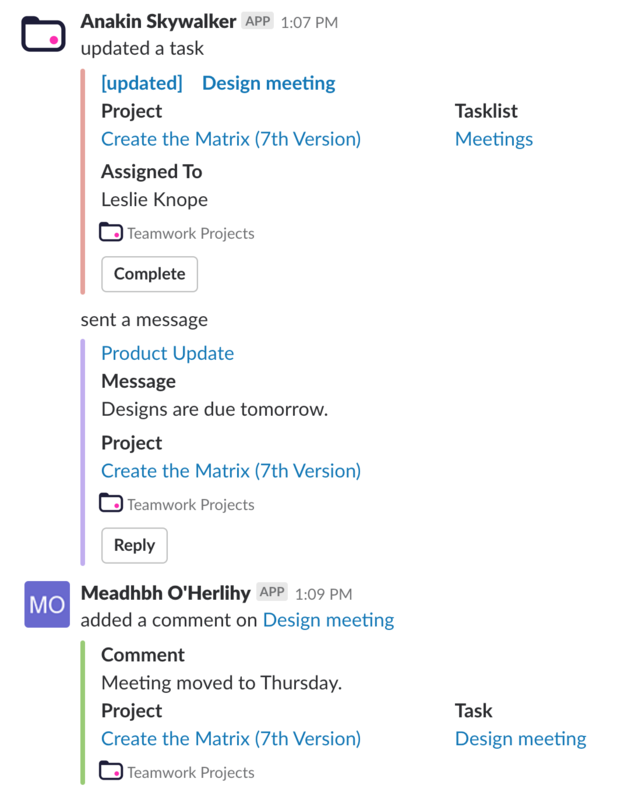 Within Teamwork Projects, the Slack integration allows you to receive and interact with Projects notifications in Slack when certain actions are performed in your projects. An example would be if a user notifies you in a comment in a project, you will receive a notification in a designated Slack channel, and can respond to it from there. Note: To use the integration, it must first be enabled in site settings by a site administrator before you can enable it in your personal integrations. Once the integration has been set up, and the private Slack channel is created, you can begin to use the integration. Whenever you receive a Projects notification in the Slack channel, you can perform different actions via the options (three dots) button to the right of the message.